This post, mainly about Olga, has been on the backburner for quite some time, as I had misplaced an interview with Olga Polizzi on my computer, but found it back recently. The interview is by Locum’s managing director James Alexander and Locum’s non-executive director Tony Hodges for Locum Destination Review, a publication of Locum Consulting. It appears the interview can stil be easily found at Locum’s website under the title Olga Polizzi, an eye for individuality. Olga Polizzi is a hotel investor, a hotel designer and a hotel proprietor: A real Hotelier. She is the daughter of famous hotelier Lord Forte. She was married to Count Alessandro Polizzi, an Italian marquess who died in a racing-car accident in 1980, leaving her to bring up her two daughters – then six and four -on her own. For 16 years she was responsible for building and design within his eponymous chain that I remember as Trusthouse Forte long before Granada raided it. 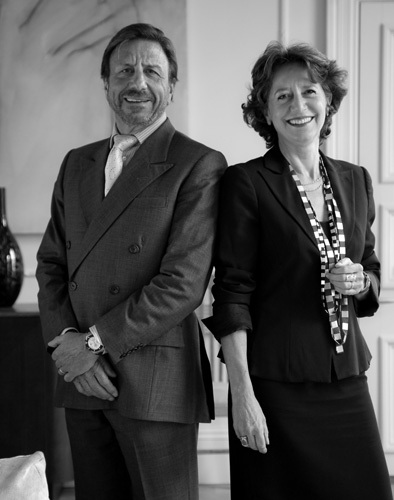 More recently, Olga has been a co-investor and again responsible for design in the mini-chain being driven by her brother, Sir Rocco Forte. Finally, she is a hotel proprietor of Hotel Tresanton in St Mawes, Cornwall. is an internationally renowned writer and broadcaster. As well as being the author of several highly acclaimed books on subjects as wide-ranging as the Shah of Iran and Rupert Murdoch, he appears regularly on television and radio. His articles have appeared in leading newspapers and journals throughout the world. Marriage to Olga Polizzi, Shawcross’s partner in the ownership and management of the Hotel Tresanton, gave Shawcross the surroundings he needed to both ‘gaze at the sea’ and pen his treatment for last year’s BBC series Queen and Country. It was three years in the making and denounced as ‘sycophantic and fawning’ to the Crown, but it became the collateral for his forthcoming book. The marriage put the couple at the epicentre of Establishment entertaining: Prince Charles and Shawcross’s old friend Camilla Parker Bowles (her father was a friend of Sir Hartley) are regular guests. And it enabled the author of Sideshow to attain what he says, as a supposed joke, is his aim in life: to be ‘a Basil Fawlty to my wife – one who writes a bit’. because the hotelier wants to distinguish the hotel from the one next door and make it more popular. And then the guest comes in and sees something different and likes it. I like going somewhere really brilliant and new … I’ll notice the door handles … but most people, you ask them what colour the room was and they won’t remember … it’s just a feeling, it’s everything in its right place, everything really comfortable. We are quite careful and budget-conscious. I can’t bear it when I see something like Sandy Lane where they’ve spent £80 million on it. We’re in there to make money and cannot spend that sort of money. The Designer hotel – a designer hotel doesn’t look at comfort … it’s so often done too cheaply, everything breaks, you take a shower and the water pours out into the room, all the little things that drive you completely mad … design is not for its own sake. She admits that she is in demand. Practically every day I get someone writing to me. What colour paint is this in the room? Where did you get this bedspread or this material? Where do you get your handles, your basins, your baths? It’s extraordinary … someone came the other day and they’ve called their house Tresanton, she trills. Yet down in the family’s gift and fashion boutique in St Mawes – ONDA – for all the well-cut clothes and Tresanton iconography on towels and lavender sachets, and the £50 umbrella and £5 soap, there is no sense that Olga Polizzi is taking her potential brand strengths seriously enough. She should. She is a talented individual with a rare eye and a fine business brain. And she has something that ordinary mortals understandably envy. In all innocence, she defines this something simply and memorably when discussing good food and good design. It’s true of both, design and food. There is a connection. It’s good taste at the end of the day. Precisely so, Mrs Polizzi. Now why not share your taste with a wider audience? Heroes make good brand stories, but so do heroines. A Telegraph article In Pollizi Custody describes her next project: The acquisition of the Grade I-listed Endsleigh House on Dartmoor and refurbishment into a five star hotel.